8 million books were published prior to the 19th century, while 1 million books were published in 2008 alone. Sine the invention of the movable type, an estimated 100 million books have been printed. 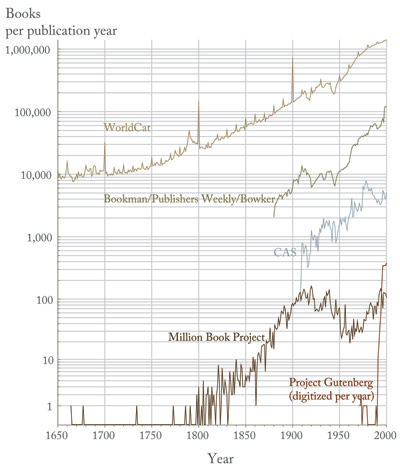 The graph below shows the number of books indexed per publication year as reported by different indexing services and the number of books digitized by The Million Book Project, and Project Gutenberg. This entry was posted in Books, Data growth, Statistics. Bookmark the permalink.